Umoru, who was also accused of murder to the Oyo State Police that he believes he was destined by God to rob. The suspect had an accomplice, Sanda. They were both arrested along the Igangan/Iganna road via Iwere Ile in Oke-Ogun, Daily Post reports. Adeleye Oyebade, the state Commissioner of Police, said the culprits were arrested for "attacking one Kehinde Rafiu, beating him with a shepherd club and machete before robbing him of his motorcycle". report says. The victim lost his life at the hospital due to injuries resulting from the violence. 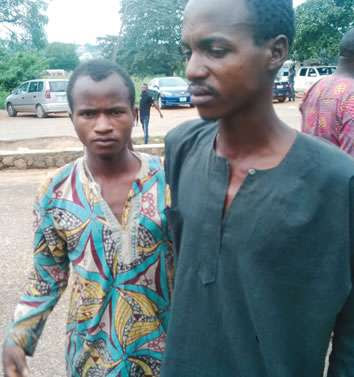 A Fulani herdsman, Amidu Umoru, who was arrested on suspicion of robbery, has revealed that he did not know he committed the offence. According to Umoru, his accomplice was the one that initiated the attack before he joined in. “Sanda cut the motorcycle owner with his cutlass and I used the club to beat him. He was seriously injured but not dead. I normally used the club to shepherd cattle." "After leaving him for dead, we took his motorcycle away to sell. We were later arrested by members of the Odua Peoples’ Congress who handed us over to the police." "Whatever Allah desires must come to past. I think it is my destiny to rob”, he said.